Installing “low-e” windows is one good way to enhance your home’s energy efficiency. 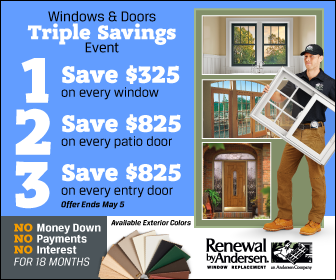 Renewal by Andersen® offers St. Charles Missouri energy efficient windows with low-e coatings. But first things first, what does low-e mean? Low-e st ands for low emissivity. Low-e coatings are thin, practically invisible layers made of metal or metallic oxide that are applied on the glass pane. Our windows have more low-e coatings than your usual energy-efficient window, and because of this, they have the capacity to let the right amount of sunlight in, and to deflect harmful rays such as ultraviolet and infrared. They can also increase the amount of visible light that enters your home, all the while making sure that the heat does not. Moreover, our windows’ metal oxide coatings can reduce water spotting as much as 99% when activated by sunlight. Here at Renewal by Andersen, we offer three different yet very similar glass options–all with low-e coatings, and we call them High-Performance™ Low-E4® glass. The st andard offering is comparably 56% more energy-efficient than your usual double-pane glass during summer and 45% more efficient in winter. It can effectively block 83% of the undesirable ultraviolet rays, and can also help you reduce your energy consumption by as much as 25%. The SmartSun™ glass is the most energy-efficient glass ever offered by Renewal by Andersen, as it is 70% more efficient in summer and 47% more efficient in winter. It can effectively block 95% of harmful ultraviolet rays, saving your furniture from fading. The Sun™ glass, while also sporting the low-e coatings, has tint coatings that reduce the amount of light that enters your home. It has the highest rating against solar heat gain and is the best at blocking the sun’s heat. If you’re contemplating on getting your windows replaced, call the company for windows installation in St. Charles MO, Renewal by Andersen of St. Louis. If you have questions, just give us a call and we’d right there.